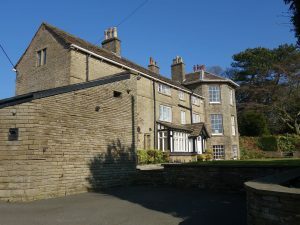 Formerly a farmhouse and farm building, Barley Grange on Bollington Road is set back from the road at the brow of the hill behind a fine stone wall. At one time this was the Barley Mow pub (the licence is thought to have been given up in the late 1860s). These days it is a private dwelling, and is Grade II listed. Click on the photo (1910) to enlarge. It was first constructed in the early 17th century, with alterations made in the late 18th century. Major additions were made in the late 19th century. It is built in sandstone, and has a roof in Kerridge stone-slate with a stone ridge. The house has a rectangular plan, is in ​two and a half storeys, and has a six-bay front. Some windows are mullioned, others are sashes or casements. To the left of the house are a 19th-century stable and a former steam-driven electric generator house. Barley Grange today, February 2019. 1851: Thomas Welsh aged fifty seven from Edgewood , Lancashire was a publican, he lived with his wife Deborah aged sixty two from Middlesex and Thomas aged fifty eight who was her brother in law. Also two grandchildren aged 5 and 10, and one servant from Derbyshire. 1861: listed as the Barley Mow Inn, it was occupied by John Pownall aged fifty a ‘farmer of six acres and Inn keeper’ from Bollington with his wife Margaret aged fifty five from Adlington Cheshire, and their family. 1871: Margaret Hammond lived there as a ‘companion’, also Lydia and Ellen and Mary Hammond listed as boarders yet only aged 9,11 and 12 years. There were also four servants. 1878: Miss Sally Greg (a farmer) lived there. 1881: Isabel Hervey whose occupation was ‘Dividends of Rents’, aged forty seven was living with her sister Rosamand aged thirty, both from Manchester. They had three servants – two were from Shropshire and one from Middlesex. Isabel and Rosamund, along with a third sister, Violet, were from a very wealthy family.Their father Robert Hervey, born in Scotland, was a merchant manufacturing chemist and, before the sisters moved to Barley Grange they lived at Lee Hall at Mottram and Collar House, Prestbury. They weren’t at Barley Grange in 1891 but were both living down south separately and living on their own means with servants. Although the two sisters surnames were Hervey, they both were listed as being married on the 1881 census when they were at Barley Grange. On the later census returns, when they lived down south, they were widowed. All the sisters and their mother Jane were born in Manchester. 1891: Frank Railton aged thirty two from Manchester lived at Barley Grange on his own means with his wife Maud aged twenty three from Alderley Edge. They have no children at this point. Three servants live there all were from Cheshire. 1901: Francis Frederick Grafton aged forty one was a retired calico printer from Manchester and wife Lilian Suzanna Gaskill Grafton aged thirty four from Skipton lived there, together with daughter Alison aged 6, son Richard aged 5 months, and four servants. The Graftons, although not on the 1891 census, were definitely there in 1894 as there was a birth announcement made in a London Newspaper. Finally the 1911 census tells us Francis Frederick Grafton still lived at Barley Grange. It lists him as married but his wife is not present at this time. He has three servants (who came from Lancashire, Derbyshire and Rutland). Richard Knowles lived here in 1915. He was a Calico Merchant from Lancashire and was aged thirty nine. His wife Dorothy was thirty one and from Shepherds Bush. They had three daughters at this point aged between 1 and 6 years, all born in Bollington. They had two servants living with them. In 1937, Thomas Skelmerdine aged forty two lived at Barley Grange. He was a major and lived with his wife Helen and two other adults George and Ellen (possibly parents). Mid 1900`s saw The Ritson family living at Barley Grange. During the second world was Barley Grange was used as a hospital for casualties.Now hidden behind a curtain or painting on one wall are signatures of some of those who stayed there, among which I (Linda) am told is the signature of Barnes Wallis who developed the bouncing bomb. 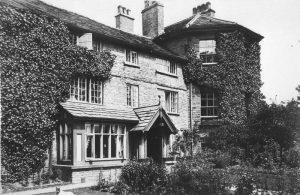 The historical information on this page about the construction of the house is taken from the Historic England website. Our thanks go to Linda Bester, who has researched census information to present an interesting history of the house’s residents.